These vary in color from a pale yellow green to darker shades of green. Size: Medium, 3/4 to 1 inch. Serpentine helps us to establish inner boundaries and to find inner peace. It is an awesome stone to meditate with. I was surprised, being a green stone, that it helped to more open my crown chakra, making me more receptive and understanding of spiritual matters I have been contemplating. Seems to open the path that Kundalini wants to travel and eases the transition of this energy movement. Placing it at the crown seemed to clear other chakras and provided a conduit for Kundalini energy to rise. This one, I feel, can be an aid to any chakra due to its balancing effects. Serpentine has a Monoclinic crystal system and is the mineral class of phyllo or sheet silicates. 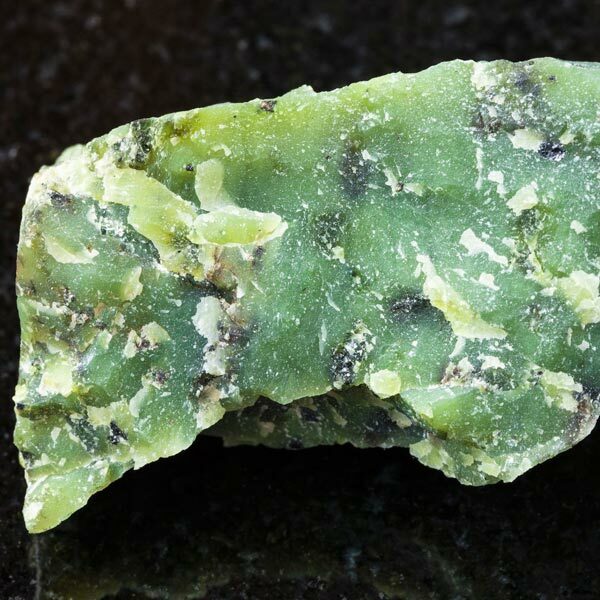 It is formed during a metamorphosis of alkaline igneous rocks, like in Peridot converting to its crystalline state. It can occur in rock forming processes as green 'leaf' serpentine or as a silvery, fibrous serpentine called chrysotile (found in Australia). Serpentine is provided in a multitude of colors. It can be found as reds, greens, browns, blackish green and even white. In it's lighter shades of green it is also known as Infinite Stone which is gentle and brings you into contact with angelic guidance. Serpentine provides its best effects when in direct skin contact. It is quite beneficial during meditation. Serpentine seems to help balance mood swings and can actually be very calming when we are stressed or nervous about life in general. It also seemed to provide some nice protection from others emotional negativity. 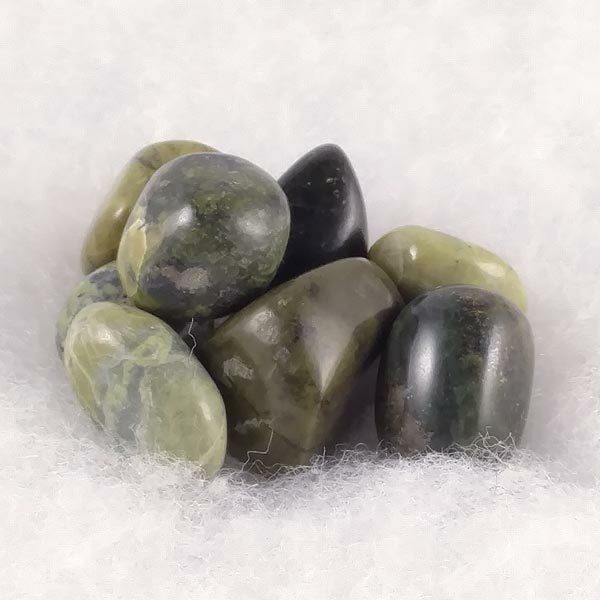 Serpentine can help to stimulate us to solve conflicts in a peaceful manner. A bit of caution should be used in this area though because there seemed a tendency to be almost too eager to compromise for the sake of peace. Just be aware of the consequences on how you will feel with what you might be agreeing to, and make choices from there. Serpentine has shown itself to help with disturbances in heart rhythms, as well as kidney and stomach complaints. It is an aid to calcium and magnesium absorption and has been shown to assist with hypoglycemia and diabetes. Over all it seems to help balance things out on many levels. Serpentine has a special affinity with Gemini but benefits all signs. It has a Projective Energy, it's Element is Fire and its Planet is Saturn. Serpentine was made into seals in ancient Assyria to receive double blessings from the Gods and Goddesses. It was also worn around the neck of nursing mothers to help regulate milk supply. Cunningham writes that it is a great one to use for guarding against poisonous critters (bees, scorpions, snakes, spiders and other troublesome insects). I plan on experimenting with that on our mosquito population on walks this summer. Update: while it sometimes seemed to have helped, it was not 100% reliable fending off our mosquito population.